Brexit to Set Julian Assange Free -- WikiLeaks Says EU Arrest Warrant Will Be "Scrapped"
London, UK – Wikileaks founder Julian Assange hopes that his self-imposed imprisonment, under threat of arrest and extradition, could finally be at an end in the aftermath of the Brexit vote. Assange has been living in the Ecuadorian embassy in London since seeking asylum there in June 2012 after Swedish authorities sought his extradition from the U.K over an alleged sexual assault. 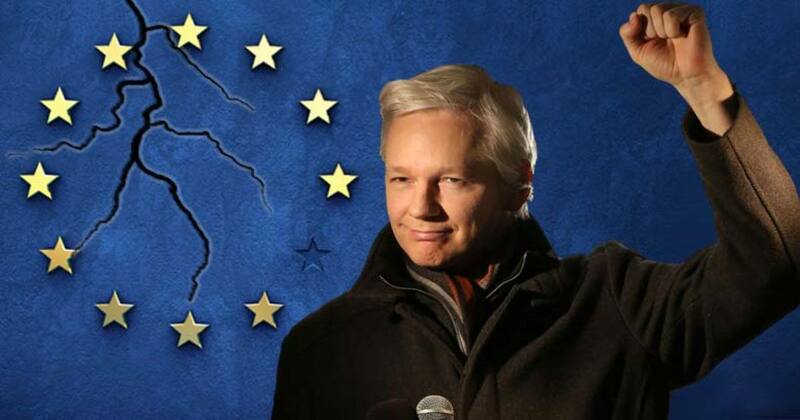 The U.K.’s decision to exit the European Union means the European Arrest Warrant (EAW), issued by Sweden, which in many circles is considered an American tactic meant to allow the U.S. government to extradite Assange, should be scrapped, according to Wikileaks. #Brexit to set Julian #Assange free, as EU arrest warrant, used as the excuse to hold him without charge, is to be scrapped in the UK. The Swedish warrant stems from a 2010 accusation of sexual assault in which Assange is wanted for questioning. Assange has repeatedly denied the accusations, but refuses to be extradited to Sweden as he believes his extradition is part of a conspiracy to extradite him to the United States to face charges. The 44-year-old Assange believes that after he is extradited to Sweden to face the charges, he will then be extradited to the U.S., where he is wanted on espionage charges over classified US documents and footage released online by his Wikileaks organization. Assange has been in a self-imposed exile within the Ecuadorian embassy since June of 2012. This exile is a means of attempting to usurp what he perceives as an illegitimate attempt to imprison him for simply allowing the U.S. public to see what type of actions are being implemented globally at the behest of the American government and carried out in the name of the American people. Earlier this year, the U.N. Working Group on Arbitrary Detention found that the U.K. and Sweden had violated Assange’s rights by his continued detention without charges, and called for his immediate release. “The Working Group on Arbitrary Detention considers that the various forms of deprivation of liberty to which Julian Assange has been subjected constitute a form of arbitrary detention,” U.N. Working Group’s head, Seong-Phil Hong said. While it is still unclear exactly how the separation between the EU and U.K. will be operationalized, the Brexit decision could have serious implications for the Wikileaks founder’s eventual freedom. The current arrest warrant is valid only in member states of the EU – which the U.K. will no longer be after this historic vote.